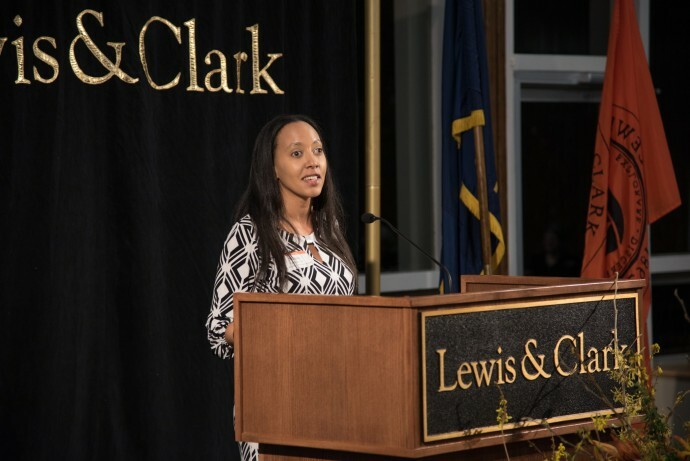 Few Lewis & Clark alumni have achieved as much as Haben Girma BA ’10. The first deaf-blind person to graduate from Harvard Law School, she advocates for equal access to technology for people with disabilities and ending what she calls their “information famine.” She has been honored by President Barack Obama, President Bill Clinton, and many others. Since earning her bachelor’s degree in sociology and anthropology at Lewis & Clark seven years ago, Haben has earned recognition as a White House Champion of Change, been named one of Forbes Magazine’s “30 Under 30” in law and policy, was featured in the BBC World Service series “Women of Africa,” and was the recipient of a 2017 Making a Difference Award at the “Black Girls Rock!” show on BET. Additionally, Lewis & Clark honored Haben with its 2016 Outstanding Young Alumna Award. Ultimately, my message is that people living with disabilities want to participate in the mainstream. We should move toward a more inclusive world, one in which it’s no longer a big deal for a deaf-blind person to go to law school—or achieve any dream. Haben’s journey began in 1988 when she was born deaf-blind in Oakland, California. Unlike her older brother, who was also born deaf-blind but in Eritrea, Africa, she was guaranteed an education by federal law. She learned Braille, and, with a very slight amount of high-frequency hearing, she learned to speak. Her education took off. By the time she applied to Lewis & Clark, her drive and determination clearly set her apart. She received a full, four-year Barbara Hirschi Neely Scholarship, the highest merit award offered to select first-year students. Until 2016, Haben served as a staff attorney at Disability Rights Advocates, where she provided free legal representation to people with disabilities whose civil rights had been violated. She credits her Lewis & Clark degree and the support of the college’s academic community, particularly the Department of Sociology and Anthropology, with inspiring her to pursue her path in advocacy. Haben now works as an independent consultant, public speaker, and author. Her memoir will be published in 2019.